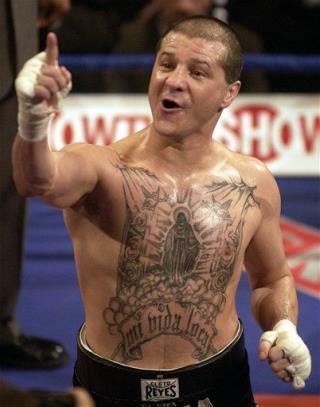 (Newser) – The boxing world is mourning five-time world champion Johnny Tapia, who was found dead at his Albuquerque home on Sunday. The prizefighter, whose career was marked by drug and alcohol addiction, arrests, and depression, was just 45. Police say foul play is not suspected. Tapia's mother was murdered when he was just eight years old, and he said the raw fury he displayed in the ring came from the horrific memory of seeing her kidnapped, the New York Times reports. A Albuquerque local gone to soon. Incredibly friendly man who with despite a troubled life still managed to make New Mexico proud of his winnings. His mother was taken from him at a young age, 8 years old, tragically, his father and him were actually reunited I believe it was in 2010. Johnny Tapia had thought his father was deceased but after a paternity test was complete it proved the man who was missing his entire life was indeed still alive. It was a honor to have the opportunity to watch your fights in person. Johnny Tapia, although you lived a troubled life style your smile and heart warmed those here in NM that did love you regardless of your troubles. May you now find peace and be reunited with your mother. He had a tragic life. I read elsewhere that his father was murdered while his mother was pregnant with him, then his mom was kidnapped, raped and hanged when he was 8. Then he was in the hospital for cocaine OD a few years ago and his brother and nephew died in a car crash on the way to see him at the hospital.